In a recent article in ASCD’s Educational Leadership, Dylan Wiliam writes about ways teachers can ask the right questions the right way. In the article, Wiliam recounts perhaps the most familiar way teachers formatively asses their students. 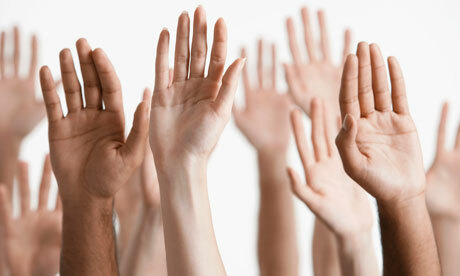 A teacher asks a question to the class and picks a student who sits eagerly waving a hand in the air. The teacher and that student interact and the class moves on. This cycle is repeated in classrooms across the country. Wiliam calls this method “the standard classroom transaction model or I-R-E (for initiation-response-evaluation).” It’s not that this method is bad, it’s just that more effective models exist. For Wiliam, “just about every aspect of this scenario actually gets in the way of learning–and it doesn’t provide enough information on what most students in the class know and need to learn.” The goal in every class should be to assess all students every 20-30 minutes of instructional time. Some traditional ways to do this are by having students use dry-erase boards to write answers, thumbs up/thumbs down, entrance/exit slips, and short, timed writing assignments. While these methods are tried and true and will work great in your classrooms, I thought it might be a good opportunity to illustrate some new tools that might change the way you assess. In this post, I’ll link to some amazing tech-savvy ways that teachers can check for everyone’s understanding. When people hear about all-student response systems, they immediately think of clickers. However, there’s a host of free services teachers can use that will get the job done just as well–and maybe with a bit more style. I’ve written about tools like Socrative, PollEverywhere, EduCanan, and TodaysMeet in previous posts. These four sites are great for generating instant student feedback during a class in different ways. For example, Socrative works great with objective-type questions while EduCanan allows users to embed questions into videos. But, if you’re looking to add targeted questions to your daily classroom routine, perhaps the best all-student response system I’ve seen recently is Nearpod. Nearpod lets teachers upload or create presentations and add questions within the presentation for students to answer. Students log on to Nearpod with a teacher-generated access code and the presentation becomes available on their device. Students can answer questions as they appear on their screens from multiple-choice questions to open-ended responses. This data gets transmitted to the teacher in real time. 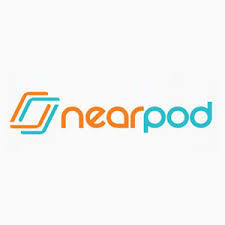 Nearpod is quickly becoming perhaps the most-used online assessment tool in our high school. The teachers at our school who discovered this deserve a TON of credit. Nearpod amazes. The reality is that not every class will work with a Nearpod presentation or TodaysMeet backchannel. If you’re short on time and computers, there are a few methods you can employ to “assess all.” Dylan Wiliam explains perhaps the simplest way for teachers to improve classroom questioning is to stop asking for volunteers. Wiliam calls this method “No Hands Up.” The traditional way to call on students during no hands up is to use names on popsicle sticks. Ask the question, then pick a stick at random and that’s the student who has to answer the question. This forces all students to think of answers in anticipation of being called on. Sometimes I think we don’t give students enough time to think of answers when we’re teaching. I know I’m guilty of sometimes choosing the first hand that gets raised. By giving students time to wait after you have asked a question and then select a candidate, slower learners will have time to formulate an authentic answer. 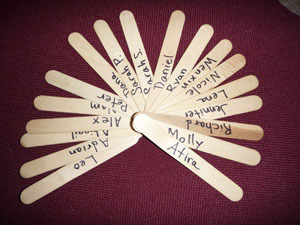 While popsicle sticks certainly work, are there any cool apps or websites out there we can use to pick students? You bet there are! There are many student randomizers available online. iLeap’s Pick A Student is free and is a very basic app to use. There are other versions that, for a dollar or two, offer better graphics and more fun. 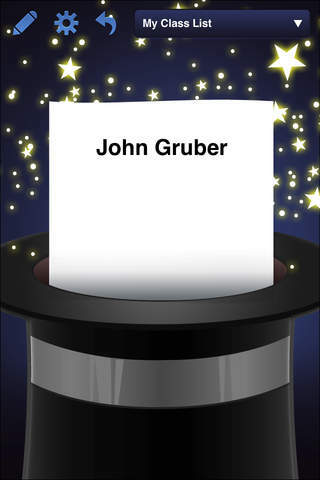 HAT by Cool Classroom Software ($.99) is one that allows teachers to select names out of a virtual hat using their device. Students aren’t repeated until everyone in the class has been called on. Another interesting possibility is a web-based service called Random Name Picker. 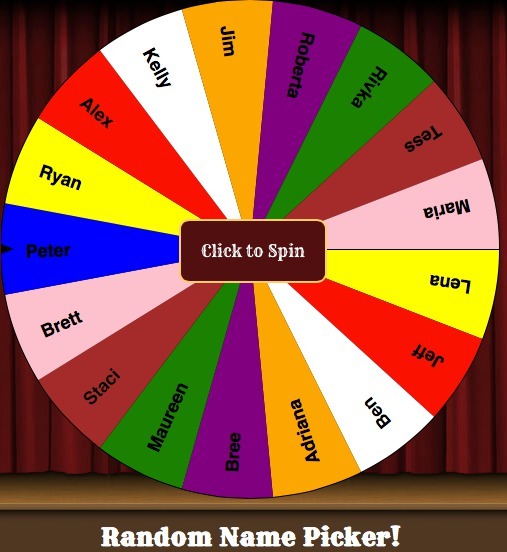 This website features a giant spinning wheel where you can add all the names of students in your class. Click to give the wheel a spin; whoever is selected has to answer the question. I’ve thrown in some names from our department on the wheel. Maybe the first person selected has to write a post for Randolphhum? During a lesson, think about trying to hear all your students’ voices. In his ASCD article, Wiliam writes about one teacher who described this assessment process as “making the students’ voices louder and making the teacher’s hearing better.” That sounds great to me. Regardless of whether you’re picking names out of a real hat or a virtual one, if you assess all students in your classes regularly, you’re bound to become a better listener.